periphery is virtually unlimited. 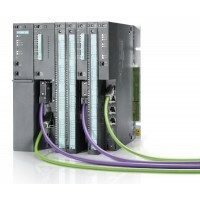 What's more, process controller signal modules can be inserted and removed while the system is live (hot swapping), making it very easy to expand the system or replace modules. Many of the S7-400 components are also available in a SIPLUS version for external environmental conditions, e.g. extended temperature range (-25?+60degC) and for use where there is aggressive atmosphere/condensation. * IF 964-DP, Profibus DP communication module!